I have been in recovery for more than 14 years and have been a member of SoberRecovery for more than 11 years. In that time, I have learned that a specific recovery program is less important than the motivation a person feels and the work that a person is willing to put into recovery. When I knew I needed to stop drinking, I did a few things right away. I turned to books for answers as I always had in my life. (We have a great and extensive Book List with titles supplied by our members). I began taking daily long walks which did wonders for all aspects of my life. And I began volunteer work which got me outside of myself and introduced me to some of the most wonderful women I have ever known. After a few years of recovery, I found SoberRecovery and it has been a lifeline to me ever since. I cannot express the amount of inspiration I get every day from our members. I did not use a formal recovery program. Some people prefer a formal group setting and face-to-face meetings while others turn to therapy or counseling which is also helpful. Still others, like me, do things on their own and use a combination of methods and ideas. On our Message Board, we fully support any and all recovery methods, and most of all, we support each other. Support groups are valuable resources for those wanting concurrent and continuing care related to rehabilitation. Organizations such as Alcoholics and Narcotics Anonymous provide an encouraging system for recovering addicts trying to stay on the right path and maintain a sober lifestyle. 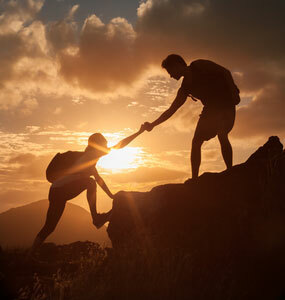 These 12-step programs provide guidelines for helping participants forgive themselves, take inventory, embrace a higher power, receive support from a sponsor and more. 12-step programs are found in many cities all over the world, so no matter where the patient needs help, he or she can find it. Getting clean and sober is tough, but staying clean and sober can be even tougher. Fortunately, there are a number of recovery groups that can help with the process. The biggest and most accessible is Alcoholics Anonymous (AA) and Narcotics Anonymous (NA). The method for both is primarily meetings and the 12 steps, a set of guiding principles for recovery that is based on the belief in a Higher Power. A fellow AA or NA member usually guides a newcomer through these steps as a sponsor. SMART Recovery: A support group that uses meetings and a self-empowerment approach to recovery focusing on changing maladaptive thinking. LifeRing: A peer-run addiction recovery group based on mutual support and self-empowerment. Women for Sobriety: A recovery group run by women for women that is based on face-to-face meetings and a set of 13 acceptance statements that focuses on self-help and positive proactive affirmation. Rational Recovery: A program that is not based on meetings but relies on Addictive Voice Recognition Technique (AVRT) which aims to identify and act against the Addictive Voice in our thoughts and decisions. Often, if you don’t know where to start, the best approach is to look at all the options out there and decide on what’s the most suitable for you. There are no rules when it comes to using a number of different methods together either. Don’t be afraid of making recovery uniquely your own!